Gustaw Ciężarek graduated from the State Music School in Szczecin where he studied with Prof. Roman Wolf, and the Feliks Nowowiejski Secondary Music School where he studied with Prof. Michał Cebrij. Continued his studies at the Frederic Chopin Academy of Music in Warsaw with Prof. Mirosław Ławrynowicz, Prof. Konstanty Andrzej Kulka, Prof. Roman Lasocki and Dr. Andrzej Gębski. For many years participated in Master Classes of String Instruments in Łańcut, Zakopane and Frombork, mastering his skills with Marina Yashvili, Wolfgang Marschner, Roland Baldini, Robert Szreder, Helen Brunner. Awared a scholarship for Masterclasses in Goch in Germany (twice). A prizewinner of violin competitions in Poznań and Elbląg (Poland). In 2009 has been laureate of Grand Prix in 6th International “Forgotten Polish Music” Competition organized by Acte Prealable label. In 2008 has been laureate of 2nd prize and special prize for best performing netherland composer's work in "12th International Contemporary Chamber Music Competition". 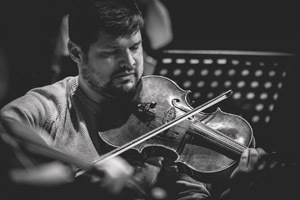 Performed Tchaikovsky, Wieniawski and Mendelsohn’s violin concertos as a soloist with the Szczecin Philharmonic Orchestra, Szczecin Opera House Orchestra and International Youth Orchestra Pomerania. Awarded scholarships by the Major of Szczecin and “TPS - Friends of Szczecin Society”. From 2008 is Concertmaster of Lomza Philharmonic. 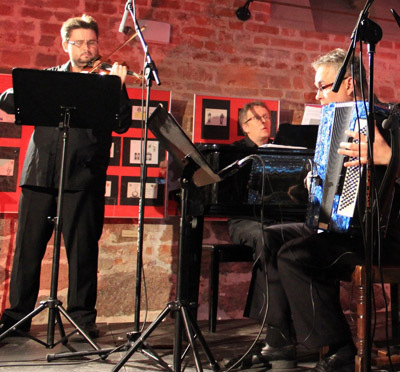 From 2010 is director of Artelier Chamber Music Festival in Szczecin. President of Szczecin Scholarship, Friends of Szczecin Society and Children Fund Scholarships, "Młoda Polska" Scholarship reciver. Soyeon Lim she completed Gimcheon High School of Arts in the class of Prof. Myeong-Hee Lee. She graduated from Keimyung University of Music in Korea in the class of Prof. Jung Yeon Kim and Prof. Andrzej Dutkiewicz and also from the F. Chopin Music Academy in Warsaw in the class of Prof. G. Sterczyński. She also completed post graduate studies in chamber music in Prof. K. Makowska – Lawrynowicz’s class. Participated in master music courses in Zamość in the class of Prof. E. Wolanin. In 2009 she won the Grand Prix prize in the 6th Edition "Polish Forgotten Music" organized by the producers Acte Prelable. Winner of 2nd prize and special award for the best performance at ‘XII International Competition of Contemporary Music’ in Kraków (2008). Winner of 2nd prize in a Korean piano competition in Daeg (South Korea). At the age of 16 years she performed as a soloist the 5th piano concerto by Beethoven with the Gimcheon High School of Arts orchestra. In 2006 she worked as a pianist and accompanist with ‘Opera na Zamku’ in Szczecin preparing for the musical ‘My Fair Lady’ in Schwedt (Germany). Since 2007 she has worked as a pianist, chamber musician and accompanist with the national philharmonic, giving a series of concerts for young people throughout Poland. In 2006 she recorded the music for the new theatre play ‘Romans z Czechowem’ in Łódź. She played music for the international theatre – musical performances of ‘Łasztownia-Lastadie’ (2006) and ‘Recycling’ (2009) created by Kana Theatre in Szczecin. As a soloist and a chamber musician she participated in many festivals, for example: International Festival for Contemporary Music in Daeg (2005), 10th International W. Lutosławski Festival of Contemporary Music in Szczecin (2007), 4th and 5th International Chamber Music Festivals in Wałbrzych (2007, 2008), 4th Summer Festival ‘W Krainie Chopina’ in Warsaw (2008), 4th Autumn Festival ‘Sacrum et Musica’ in Łomża (2008), Polish Music Festival ‘Swego nie Znacie’ in Koszalin (2009). 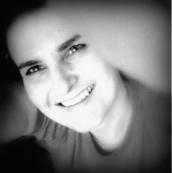 Since 2009 she has worked as a pianist at the international Music Courses in Łańcut in the classes of Prof Helen Brunner and Prof. Dariusz Smolarski. Wojciech Sławiński In 2004 he graduated with distinction from F. Chopin Music Academy in the class of K. Michalik. At present he is a ‘cellist at the Theatre of Grand Opera and the leader of the ‘Synaxis’ group. From 2003 to 2006 he worked and performed with the UBS Verbier Festival Orchestra under the direction of James Levine, Neeme Järvi, Valery Gergiev, Yurij Temirkanov, Nico Frank, Christoph von Dohnany, Charles Dutoit and great soloists such as Martha Argerich, Sarah Chang, Anna Silja, Leif Ove Andsnes, Lang Lang, Mischa Maisky, Yuri Bashmet, Vadim Repin, Maxim Vengerov, Joshua Bell, Thomas Quasthoff. Winner of distinctions at the Chamber Music Competition in Łódź (1996), Kazimierz Wiłkomirski Competition in Poznań (1997), Bach Competition in Zielona Góra (1998), 2nd prize in the ‘cello competition in Elbląg (1998), Kiejstut Bacewicza International Chamber Music Competition in Lodz and semi-finalist in the 1982 International ‘cello competition in Viña del Mar in Chile (2001). 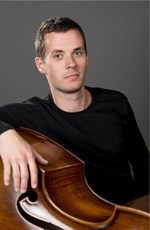 As a participant in the master courses in ‘cello playing, chamber music and composing he worked under the direction of Stanisław Firlej, Andrzej Orkisz, Victoria Yagling, Claus Reichardt, Kurt Levin, Mirosław Ławrynowicz, Wolfgang Marschner, Michal Trojanowski, Andrew Tlom, Young-Chang Cho and Pavel Głąbik. Tomasz Woźniak began learning to play the trumpet at the age of 10. He attended the Music School in Jasło (in the Subcarpathian Voivodeship) in the class of Ireneusz Fatyga. He graduated from the Fryderyk Chopin State Music High School in Rzeszów in the class of Józef Nawojski, MA. In 2003 he graduated from the Fryderyk Chopin University of Music in Warsaw in the trumpet class of Krzysztof Bednarczyk, the Assistant Professor, and was awarded an MA in Arts. In 2004-5 he perfected his skills at a postgraduate course at Conservatoire Supérieur in Paris, in the class of Guy Touvron, having been granted the Scholarship of the Minister of Culture. He has been awarded at a number of regional and national competitions of brass instruments (1993, Krosno: 1st place, 1994, Rzeszów: 2nd place; 1995, Częstochowa: 4th place). In 1996, at the National Trumpeters Festival in Kalisz, he won first place in the youth category as well as special prizes: Grand Prix and Rydwan Appolina (Appolo’s Chariot) – an award from the Minister of Culture and Art. In 1998 he was granted a scholarship from the National Children’s Fund. In 2002 he won third place at the 3rd National Trumpeters Festival in Kalisz in the open category. In 2003 he was awarded first prize at the YAMAHA Competition for Brass Instruments in Poznań and – alongside a brass quartet – second prize at the National Chamber Music Groups Festival in Warsaw. 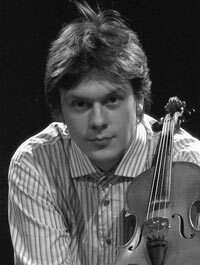 At the 6th International Competition Klassik-Festival Ruhr 2004 in Marl (Germany) he won the Chamber Music Prize (Kammermusikpreis). In 2003 and 2006 he reached the semi-final at the Maurice André International Trumpet Competition in Paris. He was actively involved in mastery courses conducted by such musicians as André Henry (Kalisz), Siergiej Nakariakow (Warsaw), Gabrielle Cassone (Porcia), Reinhold Friedrich and Fred Mills (Brussells) or Andrea Giuffredi (Lieksa). As a soloist he gave concerts alongside the Rzeszow Philharmonic Orchestra, the Świętokrzyska Philharmonic Orchestra, the Orchestra of the Academy of Music in Warsaw or the Kiev Philharmonic Orchestra in such locations as the Royal Castle in Warsaw, Germany, Italy and France. He took part in a number of national competitions such as the Warsaw Autumn (2005, 2006, 2010), the Contemporary Music Laboratory (Warsaw 2006, Białystok 2010), the National Trumpeters Festival in Kalisz (2005, 2008), the International Festival of Organ and Chamber Music “Ars Musica” in Iwonicz (2006, 2010), the 2nd Praga Spring Music Festival (2006) and the Warsaw Music Encounters (2008). He has also cooperated with the National Philharmonic Orchestra, the Grand Theatre – National Opera House in Warsaw, the Simfonia Varsovia Orchestra, the Rzeszow Philharmonic Orchestra, the Warsaw “Filharmonia” Orchestra as well as with the Conservatoire Supérieur Orchestra in Paris and the Jeunesses Musicales de France Orchestra. 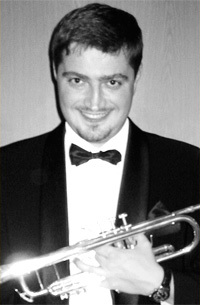 In 2005-2007 he was the 1st trumpeter of the Podlaska Philharmonic Orchestra. The conductors he has worked with include K. Penderecki, J. Semkow, A. Wit, J. Maksymiuk, M. Kasprzyk, K. Kord, M.J. Błaszczyk, W. Rajski, M. Nałęcz-Niesiołowski, M. Pijarowski, T. Wojciechowski, K. Bumann, M. Ziml, Sz. Kawalla, K. Słowiński, P. Sułkowski and Ł. Borowicz. He still gives concerts as a soloist and a chamber musician performing the repertoire stretching from the Baroque to contemporary music. As for the latter he was often the first one to perform certain pieces (by M. Borkowski, M. Błażewicz, A. Nawrocka). At present, he is working at the Polish Radio Orchestra in Warsaw. Trio’you is the original sounding acoustic trio. The band performs classical music, which with connection of original arrangements and innovative instruments sounds creates original concert offer. 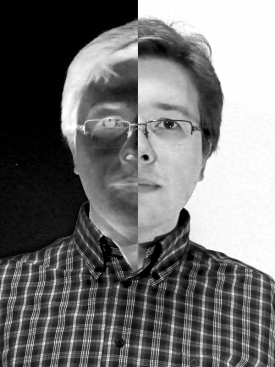 Tri’you consists of: Cezary Gójski – violin, Krzysztof Szczerbuk – accordion, Grzegorz Bogdan – piano, percussion instruments and other sounds.